Leading Manufacturer of zinc plated exhaust clamps from Faridabad. We are leading manufacturer and supplier of very high quality Zinc Plated Exhaust Clamps to our trusted customers. These products are manufactured using very high quality yellow and white zinc plated material as per specification provided by our customers. These products are available in different standard sizes and they have a very unique sheet thickness. These products undergo various quality tests to ensure superior quality and flawless performances. 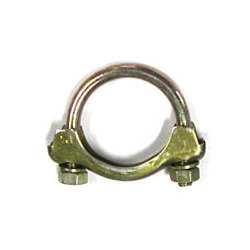 U Bolt: 3/8" &5/16" 1/4"
Looking for Zinc Plated Exhaust Clamps ?